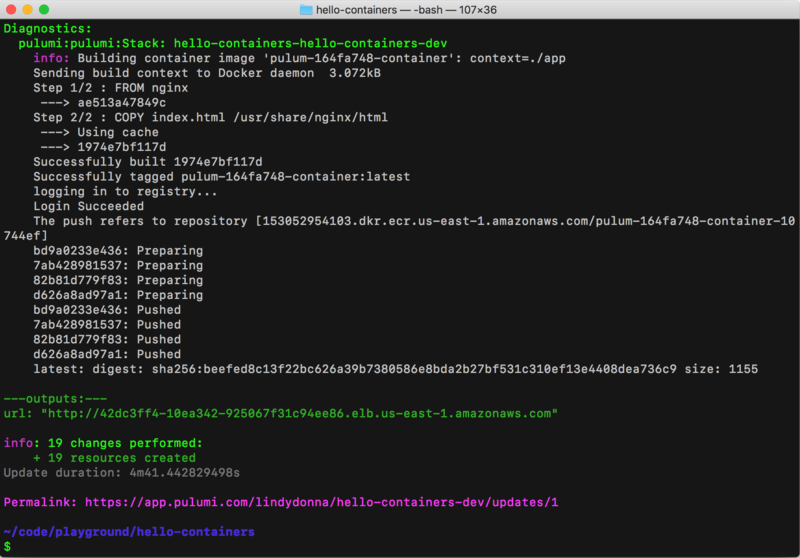 In this blog post, we'll deploy a simple Docker container running NGINX. If this is your first time using Pulumi, go to https://app.pulumi.com and sign in with GitHub. @"%SystemRoot%\System32\WindowsPowerShell\v1.0\powershell.exe" -NoProfile -InputFormat None -ExecutionPolicy Bypass -Command "iex ((New-Object System.Net.WebClient).DownloadString('https://get.pulumi.com/install.ps1'))"
You'll deploy this app to your own AWS account, so follow the steps to configure your AWS account. Make sure you have Node.js installed, with a version of 6.10.x or later. Finally, make sure Docker is installed and running. 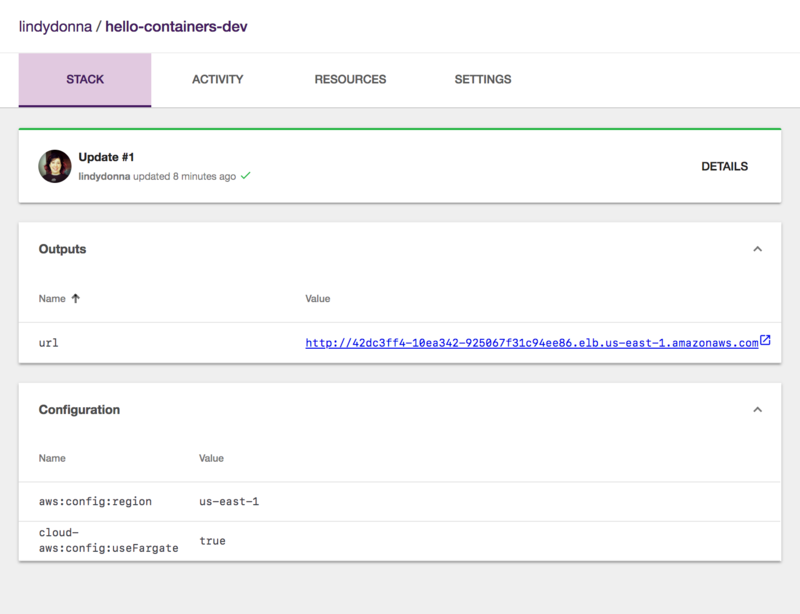 These 15 lines of code are everything you need to deploy a custom container! We're using cloud.Service, which is a high-level, convenient interface for building containers and provisioning an AWS container service. Using the build property, we point to a folder containing a Dockerfile, which is app in this case. 3. Now, let's create a Dockerfile and a static page. Create a subfolder app with the following files. 5. 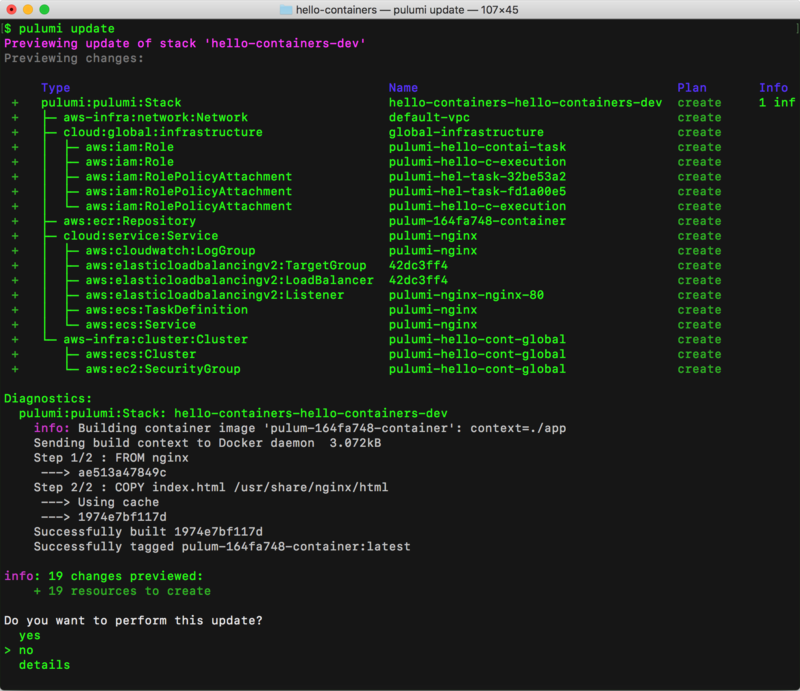 Configure Pulumi to use AWS Fargate. Note that, currently, Fargate is available only in us-east-1, us-east-2, us-west-2, and eu-west-1. To deploy both the infrastructure and app code, we'll run pulumi update. This command first shows a preview of all the resources that will be created and prompts for confirmation. 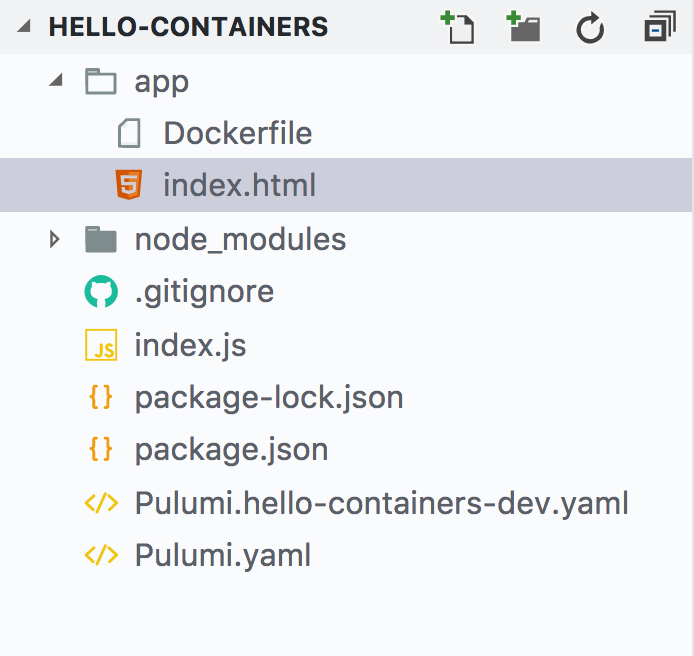 During the preview phase, Pulumi invokes docker build. Choose the yes option to deploy to AWS. This will take about 5 minutes. 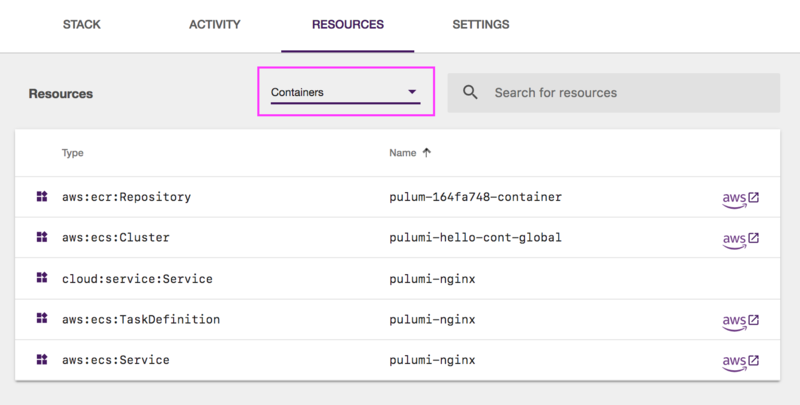 Pulumi automatically builds and provisions an AWS container repository in ECR, builds the Docker container, and places the image in the repository. This all happens automatically and does not require manual configuration on your part. At the end of the update, you'll see a link to the Pulumi Console that shows the details of the deployment. Go to this link and click the Resources tab. You'll see all the resources you've created. 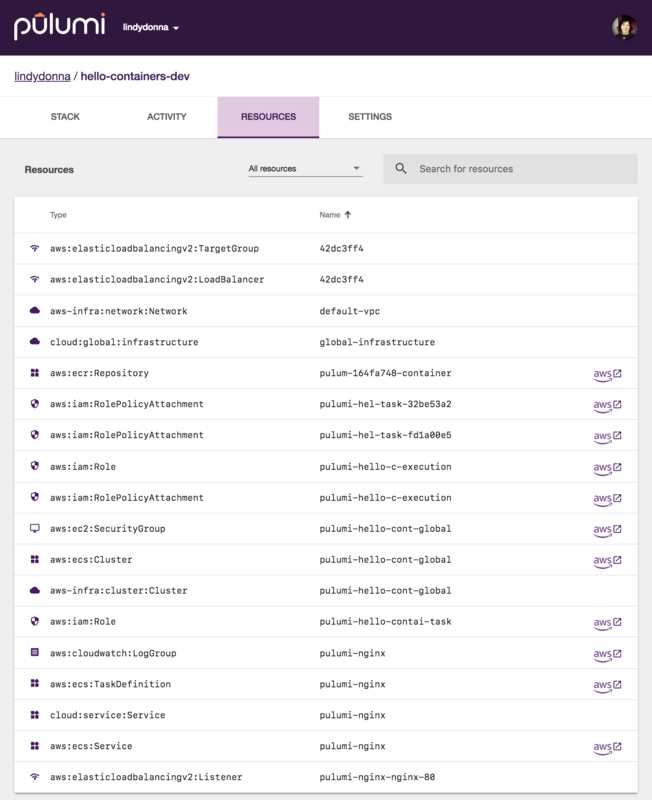 Notice that Pulumi has created an ECR repository, a load balancer, an ECS service and task definition, and IAM roles. You can also filter to just container resources using the filter dropdown. You can view container frontend and compute logs via the pulumi logs command. You can see here that most of the traffic is hitting routes that don't exist, aside from the last log line where I navigated to the site using Chrome. Since this is an HTTP server that's open to the internet, it's not uncommon for attackers to try to find a security vulnerability on a site. Fortunately, our container is serving only static content. The logs command makes it easy to get details on your site traffic. Collecting logs for stack hello-containers-dev since 2018-06-15T15:01:18.000-07:00. 2018-06-15T15:27:47.468-07:00[                  pulumi-nginx] 2018/06/15 22:27:47 [error] 5#5: *4 open() "/usr/share/nginx/html/proxychecker.axd" failed (2: No such file or directory), client: 62.210.157.152, server: localhost, request: "GET http://proxy.dazhou.net/proxychecker.axd?e=457758511%40qq.com&p=http%3A%2F%2F34.201.27.186%3A80&s=AS HTTP/1.1", host: "proxy.dazhou.net"
2018-06-15T15:27:47.468-07:00[                  pulumi-nginx] 62.210.157.152 - - [15/Jun/2018:22:27:47 +0000] "GET http://proxy.dazhou.net/proxychecker.axd?e=457758511%40qq.com&p=http%3A%2F%2F34.201.27.186%3A80&s=AS HTTP/1.1" 404 170 "-" "Go-http-client/1.1" "-"
2018-06-15T15:32:02.128-07:00[                  pulumi-nginx] 2018/06/15 22:32:02 [error] 5#5: *382 "/usr/share/nginx/html/phpmyadmin/index.html" is not found (2: No such file or directory), client: 178.239.177.212, server: localhost, request: "HEAD http://34.201.27.186:80/phpmyadmin/ HTTP/1.1", host: "34.201.27.186"
2018-06-15T16:07:05.874-07:00[                  pulumi-nginx] 172.31.44.144 - - [15/Jun/2018:23:07:05 +0000] "GET / HTTP/1.1" 304 0 "-" "Mozilla/5.0 (Macintosh; Intel Mac OS X 10_13_4) AppleWebKit/537.36 (KHTML, like Gecko) Chrome/67.0.3396.87 Safari/537.36" "-"
To clean up the resources we've provisioned, run pulumi destroy. The sample code for this post is available in the Pulumi examples repo on GitHub. For an example application that connects two containers, see the Voting App TypeScript sample.